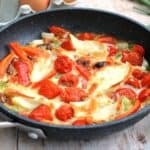 Fry the spring onions, cherry plum tomatoes and sliced red pepper in a little spray oil or light cooking spray in a small ovenproof frying pan for a few minutes until soft. Beat the eggs in a small bowl, season, then pour the eggs over the vegetables in the small frying pan. Swirl the eggs around the pan and use a wooden spoon to move the eggs aside as they set so that it cooks through. Allow to cook for a few minutes and in the meantime preheat your grill (broiler) to medium heat. Add the sliced halloumi on top of the frittata and then place the frying pan (make sure you are using an ovenproof one) under the grill to brown the top and cook through. Grill for 3-4 minutes, checking to make sure it doesn't burn or brown too quickly. Remove the frying pan from the oven using an oven glove. Allow to cool for a couple of minutes then use a spatula or wooden spoon to loosen the edges and slide the frittata onto a plate to serve.